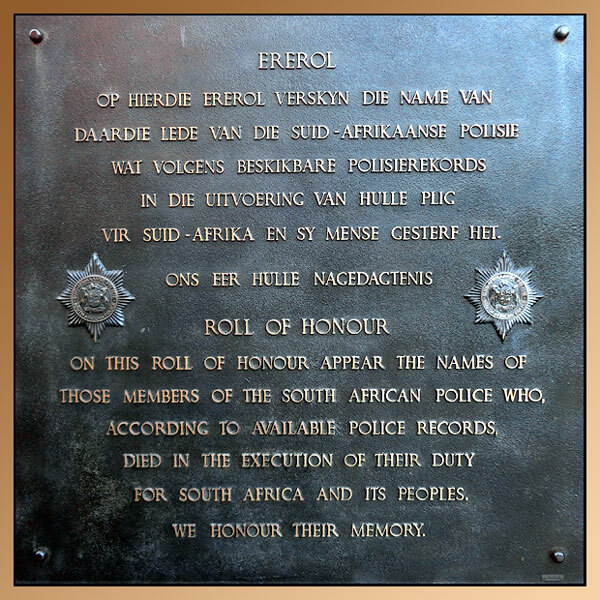 ​South African Police Memorial, Union Buildings, Pretoria. Unveiled in 1984 by State President P.W. Botha. The Memorial consists of three main elements, namely a two metre high solid wall against which the Police emblem and a Roll of Honour are attached, which, with a second, higher wall, encloses a curved row of pillars. 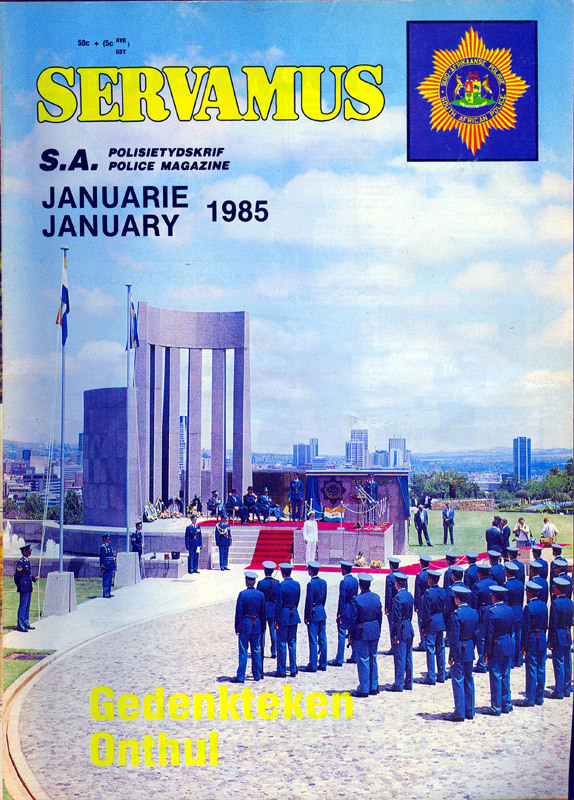 The solid wall represents the protection given by the SA Police, while the seven pillars, with the strong horizontal architave, represent the various branches of service that are bound together by unity and co-ordination of action. 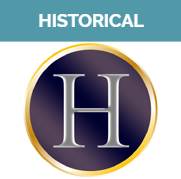 The growth out of the history of the nation is accentuated by the visual link with the Voortrekker Monument and the Union Buildings. Die Gedenkteken bestaan uit drie hoofelemente, naamlik 'n muur van twee meter hoog waarteen die Polisiewapen en 'n Ererol aangebring is en 'n tweede hoër muur wat saam met die eerste 'n geboe ry suile omsluit. 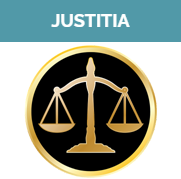 Die soliede muur versinnebeeld die beskermingstaak van die Suid-Afrikaanse Polisie terwyl die sewe suile met die sterk horisontale argitaaf die verskillende vertakkinge van dienslewering uitbeeld, wat deur eenheid en koördinering van optrede saamgesnoer word. 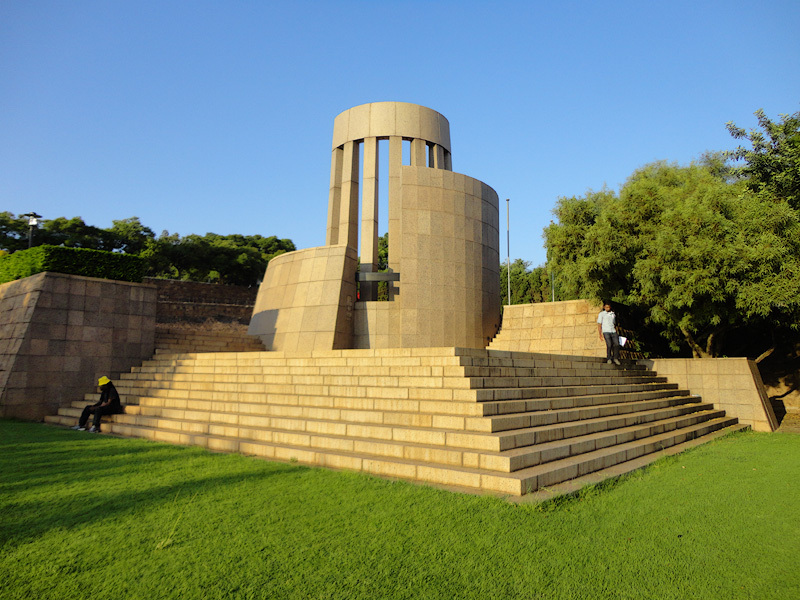 Die groei vanuit die volksgeskiedenis en die getrouheid aan die staat word beklemtaan deur die visuele skakeling met die Voortrekkermonument en die Uniegebou. Memorial displaying the former 'old' SA Police emblem. 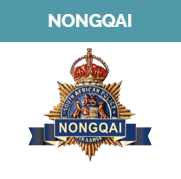 The "old" South African Police emblem (1913-1994) has been removed and replaced by the "new" South African Police Service emblem. 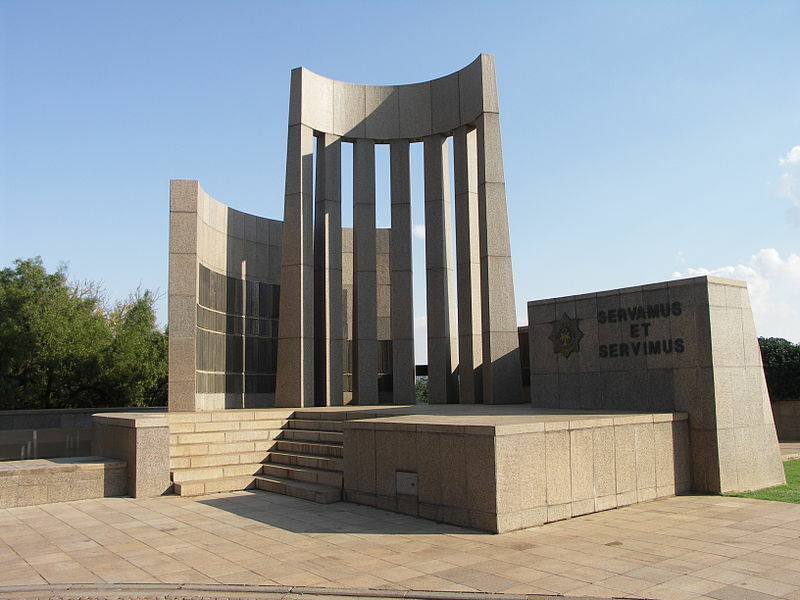 The corner stone was unveiled by Gen MCW Geldenhuys and the memorial was unveiled in 1984 by State President P.W. Botha. 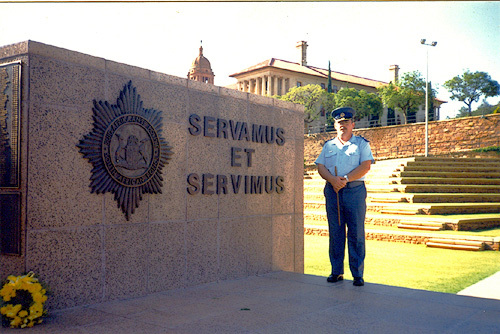 This photograph taken in 1989 shows the former SA Police emblem. 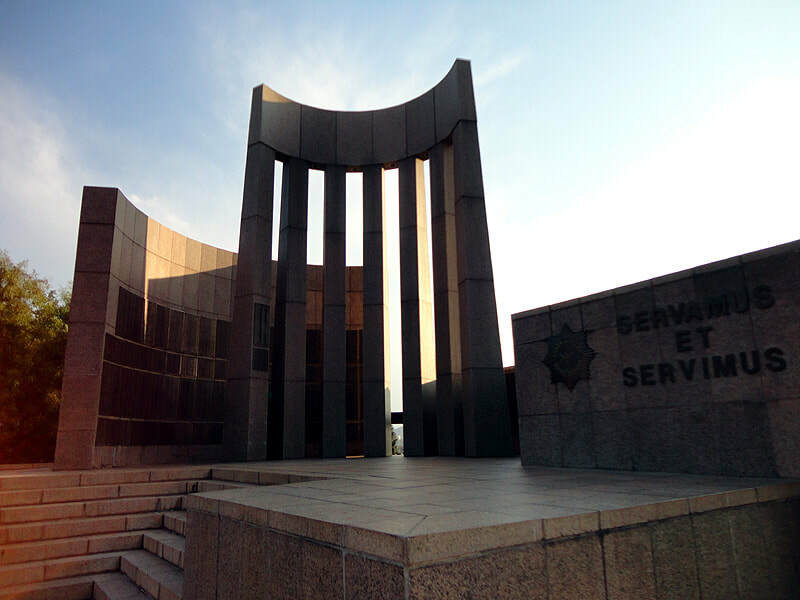 The memorial commemorates officers ONLY of the South African Police (1913 - 1994) and SAPS from 1994 onward. Police officers who died in the former TVBC- and National States are not mentioned here. 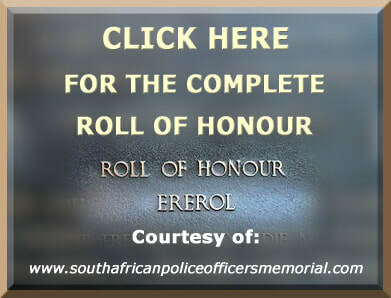 ​IN MEMORY OF THOSE MEMBERS OF THE SOUTH AFRICAN POLICE WHO SACRIFICED THEIR LIVES FOR SOUTH AFRICA AND DIED SERVING. 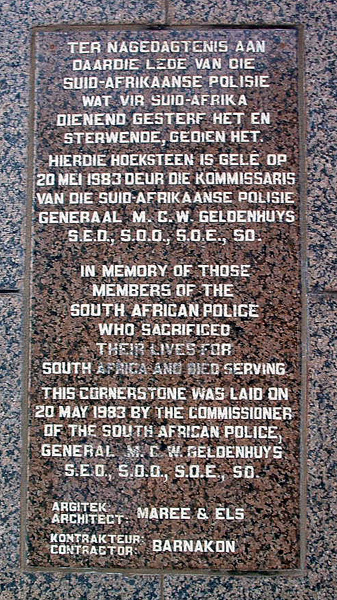 THIS CORNERSTONE WAS LAID ON 20 MAY 1983 BY THE COMMISSIONER OF THE SOUTH AFRICAN POLICE GENERAL M.C.W. GELDENHUYS S.E.O., S.O.O., S.O.E., SO. 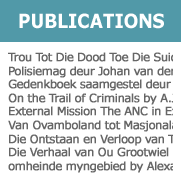 TER NAGEDAGTENIS AAN DAARDIE LEDE VAN DIE SUID-AFRIKAANSE POLISIE WAT VIR SUID-AFRIKA DIENEND GESTERF HET EN STERWENDE, GEDIEN HET. HIERDIE HOEKSTEUN IS GELÊ OP 20 MEI 1983 DEUR DIE KOMMISSARIS VAN DIE SUID-AFRIKAANSE POLISIE GENERAAL M.C.W. GELDENHUYS S.E.O., S.O.O., S.O.E., SO. 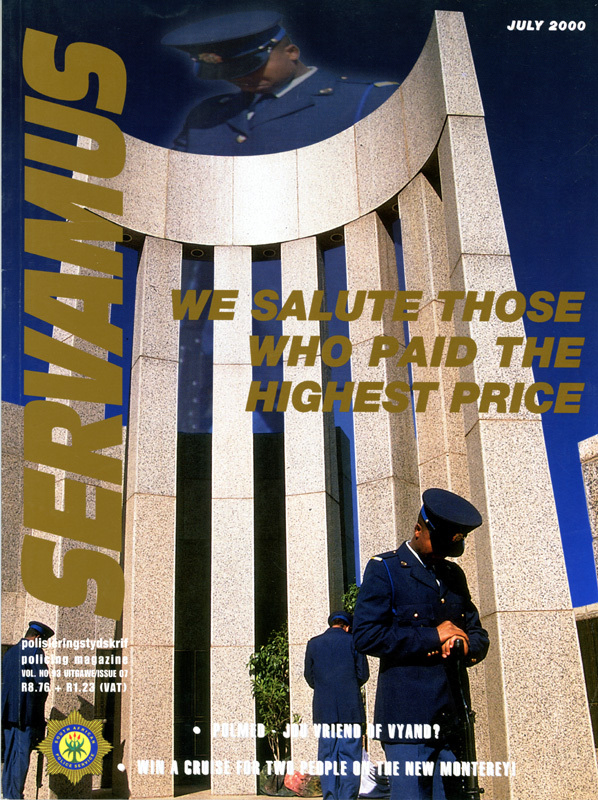 The memorial featured on covers of the S.A. Police Magazine, SERVAMUS. 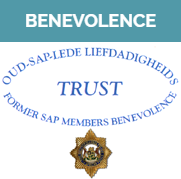 January 1985 during the old dispensation (South African Police Force) and July 2000 - new dispensation (South African Police Service).